I got Rafael Lovato Jr’s Ultimate Pressure Passing DVD to further pursue what has been my goal over the last two years, to progressively get tighter throughout my game. Instead of relying on mini explosive movements, or small-guy quickness, I have wanted to find the ways that even as a small guy, I can pressure my way through an opponent’s guard. As a member of BJJ Library, I had seen some stuff that I liked from Lovato Jr, and after a couple of very strong recommendations for this product from trusted training partners, I decided to pick it up. Factual accuracy disclaimers: This DVD is not a new product, having come out a number of years ago. Also, it’s not a “DVD,” it’s an instant download, which is kind of its own plus (no wait). The bundle I got came with gi and nogi versions, and a “2.0” update, released more recently. I’ll review them all here as if one product, because they can be purchased as such. The series could have been called “Passing from Lovato Headquarters,” for its focus on HQ as the main starting point. I actually appreciate this, because it was focused, and the game went deep from there. I prefer this to only scratching the surface on many unrelated situations. The first times I watched, I did wish the videos offered more entries into Headquarters. After going out and using the material from the DVD, however, I found that it was an easy position to get to. Perhaps a very beginner would run into more trouble, but I think one only needs to drill it a bit (or even just sit in it a bit) to make the uncomplicated position second nature, and the transitions into it are few. My experiences with using the Headquarters Position, since watching the DVD, have been very positive. As the passer, it doesn’t feel like you’re doing as much as you are, because it truly does shut down tons of options for the bottom player. Also, as Lovato explains, the number one go-to pass is the X-Pass. I have gotten the X-Pass (which was never one I used before) probably 80% of the time that I hit HQ. I am able to get to HQ on most opponents, from an open guard scenario. The back-up to X-Pass, when your opponent prevents it, by grabbing your heel, is to progress to another main takeaway of the video series, which is Lovato’s “Side Smash” position. Another position where it doesn’t feel like much for the top guy, but is debilitatingly uncomfortable to the bottom guy, Side Smash is another potently dominant position. Lovato covers numerous entries to, and passes from Side Smash. One of the ways I best come to a meta-understanding of a collection of moves, such as in an instructional video series, is to create a MindMap of it. Ideally, the MindMap mimics the decision tree you’ll run through in training. (From here, this or this can happen. If THIS does, do this or this, etc). 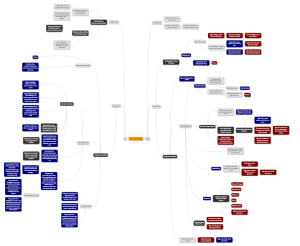 Lovato’s Pressure Passing lends itself to MindMapping, because it truly is a complete system. This thumbnail below was taken prior to the MindMap’s completion, but gives you an idea. At the end of all branches, position improvements (passes, back takes) are blue, and submissions are red. Secondary positions (which should be drilled from, on their own) in which dominance improves are dark grey. You are welcome to view the full, live MindMap by clicking here (uses Google’s MindMup software). This is a collection worth getting. For my wants, it had it all. Instant download, clear instruction, good quality video, all angles clearly presented, no over- or under-explaining, immediate applicability of material, promising early results following viewings and implementation on the mat. Lovato is clearly a trustworthy authority, is likable, and humbly presents the information and lets it speak for itself. If you’re interested in the series, it’s available online. The top link I originally googled was under malware attack when I first purchased it, and still is.